During October 2006, a survey prior to development was conducted in the eastern part of Giv‘at Rabbi (Jebel al-‘Ayin; Permit No. A-4921; map ref. NIG 2260–70/7366–72; OIG 1760–70/2366–72), where the Nazareth industrial zone is slated to be built. The survey, undertaken on behalf of the Israel Antiquities Authority and financed by the Government Development Company, was directed by H. Khalaily and O. Marder, with the assistance of S. Golan and O. Barzilai (field survey) and A. Shapiro (surveying). Sites from the Wadi Rabah culture of the Late Neolithic period were discovered in the vicinity of Giv‘at Rabbi (S. Sadeh. 1994. Pottery of the 5th Millennium BC in Israel and Neighbouring Regions. Ph.D. diss., Tel Aviv University, pp. 134–137). At the foot of the hill, remains dating to Early Bronze I were uncovered (Permit No. A-4648) and when the ‘Illut Junction was being widened, a rich habitation layer that dated to the Pre-Pottery Neolithic B and included knapping pits and remains of buildings was exposed (License No. 137/1995). Recent excavations at nearby ‘En Zippori (HA-ESI 117) revealed a settlement level from the Late Neolithic period/Wadi Rabah culture. To the east of the ‘Illut road, the region had not been previously surveyed but several probe trenches dug in the area caused severe damage to several knapping pits that contained vast numbers of cores and waste material. 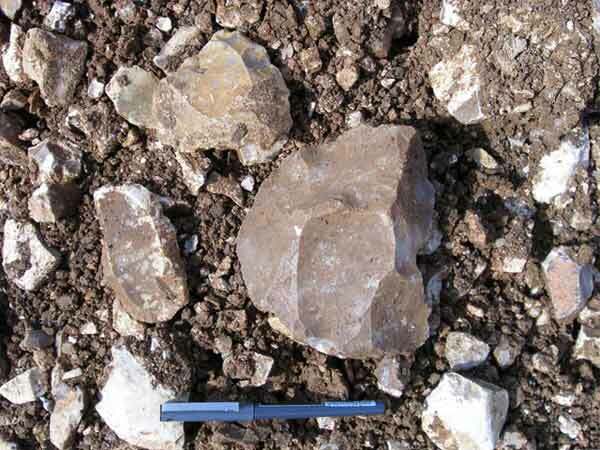 A preliminary examination of the trench sections revealed that these knapping pits dated to the Pre-Pottery Neolithic B and were located in a leveled area covered with a high density of flaked flint. The exposure of the pits and the flint density necessitated a thorough survey whose aims were to locate prehistoric sites; to characterize the sites and the centers of activity in the area where the worked flint is extensively scattered and to identify the flint industry and its chronological association. The area was divided into ten plots (1–10; Fig. 1), which were measured by GPS and separately surveyed; the finds were sampled and recorded on a map. The survey of the agricultural area proved inefficient and required a random sampling of the density of the finds and their preliminary sorting, to locate the main activity center and areas with scattered flint that were not necessarily within the site’s limits. The probe trenches were marked and measured and their finds were examined within the framework of the different plots. A plowed plot of triangular shape, whose base is in the west and its surface is leveled and higher than the surrounding area. A high-density flint scatter of c. 220 items per sq m was found. The plot was sampled in two spots (11, 12) and the flint scatters revealed in both were identical. The preliminary sorting shows that most of the flint items (72%) are rolled natural chunks, while the flaked items constitute 28% of the sorted finds. These include Neolithic artifacts (bipolar cores, bi-facials and a polished axe), as well as those of the Mousterian culture (Middle Paleolithic period). A recently cultivated plot whose outline is rectangular and its area is c. 8 dunams. Like Plot 1, it is also covered with flint. The distribution is less dense and the items are larger, but without chips. The plot was sampled in three spots (21–23) and the density of the finds was c. 180 items per sq m, of which 145 were natural items and the rest—flaked. The finds were mixed and their date is similar to the finds of Plot 1. The plot is square and 0.5 m lower than Plot 2. Its western part is situated within the declared antiquities area and its eastern part is located along its fringes. The surface descends gently to the south, toward the wadi. The flint density is especially high as is the number of worked flint implements. The finds are homogenous and mostly man-made. The high number of bifacial items and cores in various stages of preparation should be noted. Three probe trenches, aligned north–south, were dug (101/1–3), damaging a large number of knapping pits. Two knapping pits of naviform cores were damaged in Trench 101/1 (Fig. 2) and in Trenches 101/2, 101/3, three knapping pits were harmed. The distance between the pits did not exceed 1 m and their depth is presumed to be similar. This plot, to the west of Plot 3, is its natural continuation. A rocky hill on its western border has a soil cover whose thickness does not exceed 0.4 m. The plot’s area is c. 8 dunams and in spite of its stone clearance and cultivation, it was covered with a high density of flint. Two probe trenches (102/1, 102/2) were dug in the plot and knapping pits were noted at their northern ends. 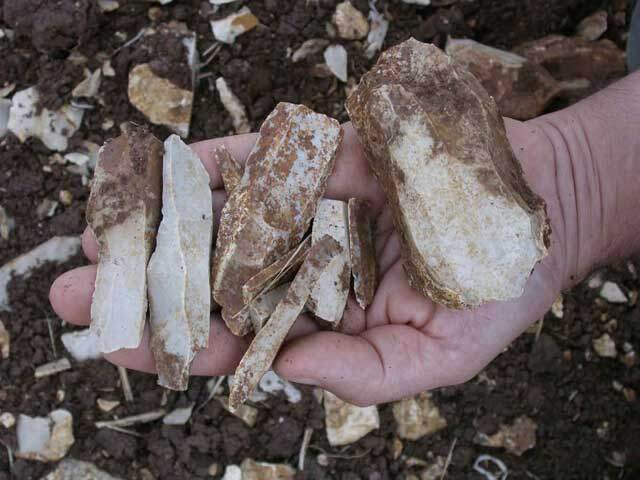 The finds included mostly knapped flint products, among them numerous cores that were discarded in various stages of production, mainly perform and exhausted cores. In addition, many bifacial tools that were discarded in different stages of production were identified. The high density of flaked flint, as well as the presence of several knapping pits indicates that intensive prehistoric activity took place in the area of the plot, including both knapping, shaping tools and dumping into waste pits; hence, it seems that the center of the site was located in this plot. This plot is situated on a low rocky hill whose eastern and western slopes were moderate compared to its steeper southern slopes. The hill is covered with seasonal vegetation that caused difficulties in performing a systematic survey. That notwithstanding, a number of installations, wall stumps and a large stone clearance heap (5/1), whose stones were apparently gathered originally from a nearby field, were located at the top of the hill. Limestone bedrock with elongated flint lenses was exposed in several places and many natural flint chunks were scattered nearby. These two plots in the western part of the area differ in their soil and finds. Topographically speaking, Plot 6 is similar to the previous plots. It is leveled, except for its northeastern corner, which is in the hill area of Plot 5. On its higher part, a stone clearance heap (6/1) and the remains of a square building (6/2) nearby, are found. The flint artifacts are of average density and their concentration is well defined (c. 2 dunams). The majority of the flint is natural chunks; however, items of the Mousterian industry were also identified. Plot 7 lies next to the approach road leading to ‘Illut. The soil is a dark colored sediment and judging by the nature of the finds (Pottery Neolithic), it seems that this plot is, in fact, the continuation of the Giv‘at Rabbi site, west of the road. This plot is parallel to Plot 1 in the southern part of the surveyed area. Crossing the center of the plot is a broad, east–west oriented, drainage ditch, which was mostly dug in heavy clayey soil (terra rossa), but has a pale yellow spot that stands out prominently in its middle, which contained a large amount of flint (8/1). An examination of the spot raised the possibility that this was an ancient stream channel that flowed from south to north and mostly drained flint into it. Analysis of the flint revealed that this was a homogenous assemblage that included cores (Fig. 3), waste material and numerous tools from the Middle Paleolithic period (the Mousterian culture). The flint was not abraded and its sharp ends indicate that the Mousterian site was most likely in the immediate vicinity of the stream, whose channel probably flowed into the area of the site. These two plots, on the southern side of the surveyed area, are cultivated and have a thick clayey soil (in excess of 2 m deep); both plots have no archaeological remains. (1) A unique knapping site from the Pre-Pottery Neolithic B in Plots 3 and 4. The finds in the waste pits provide an excellent tool for the reconstruction of the knapping technologies during the PPNB. 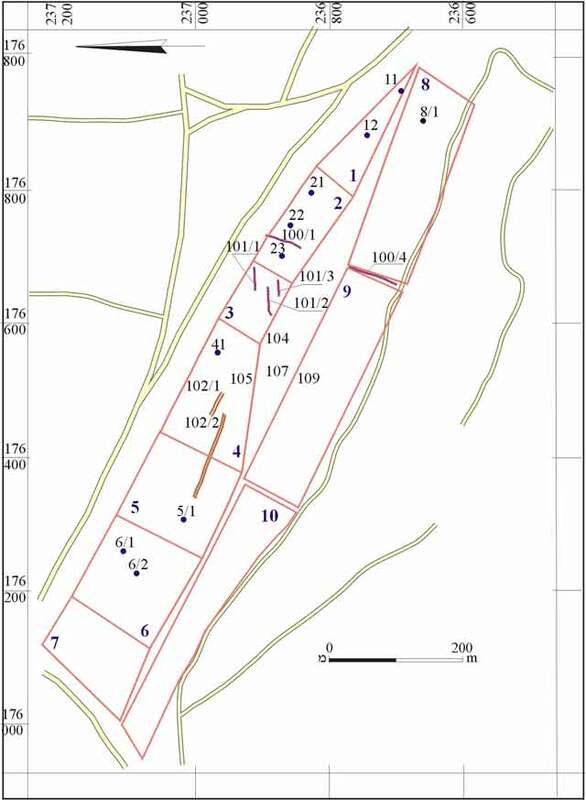 (2) A Pre-Pottery Neolithic and Pottery Neolithic site in Plot 7 and in part of Plot 6, most likely along the eastern fringes of the Giv‘at Rabbi-‘Illut site. The new road divided between the western and eastern parts of the site. (3) A well-defined locality in Plot 8 with finds from the Mousterian culture. 2. Plot 3, finds from knapping pits. 3. Plot 8, Mousterian finds.